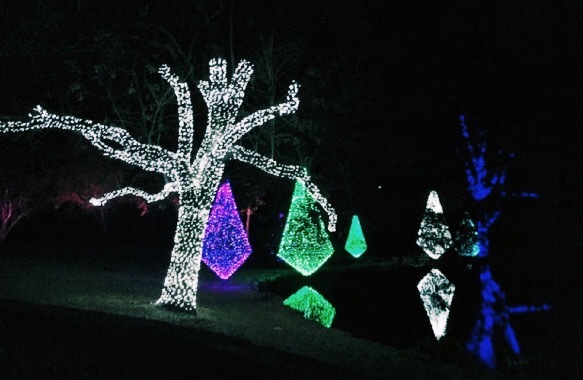 The Cheekwood Holiday Lights Festival is an annual event that Cheekwood Estate and Gardens creates every year to display magnificent light fixtures and designs of the holiday season. This isn’t just a visit to a park, the Holiday Lights Festival is a full on experience. It includes everything from a 1-mile lighted pathway, to a real live viewing of reindeer. The path has amazing lights and is perfect for nice, winter nights. I highly suggest to go in early December when it’s not as crowded but it’s still a good way to get into the Christmas spirit. When you walk along the path you discover may different outdoor lights displayed, but my favorite is the fire pits because there are s’mores supplies available for purchase as well as drinks stations for hot chocolate or apple cider. Adult beverages are also offered. There’s also an amazing Poinsettia Tree inside the estate mansion which is also decorated in a traditional 19th Century design. The tree goes all the way up to the top of the two floor ceiling! It’s a beautiful place for a picture. The best, most kid-friendly part of the night is the visit with Santa. When I was younger, I loved to go see him and tell him what I want for Christmas that year. It’s a great memory for your kids. This is another picture perfect opportunity! 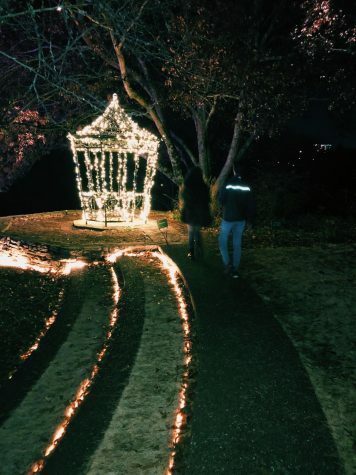 is much to love at Cheekwood and all of the experiences that come along with it and I definitely would recommend making this your family Christmas tradition.